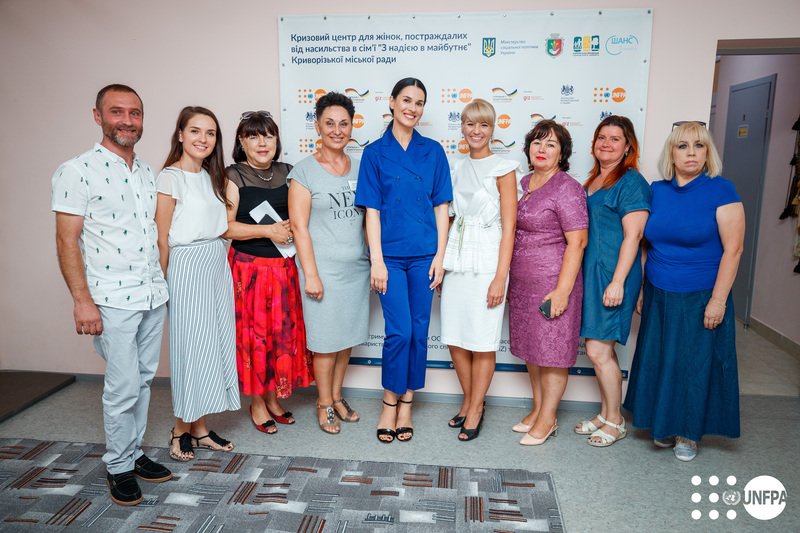 During her visit, Ukrainian TV presenter and actress Maria Efrosinina talked to women staying in the "Hope to the Future" crisis center, met with specialists who work with the victims, and learned about the activities of key state structures ensuring violence response in the city. "It was a difficult visit to me. It is unlike anything else I did before. It gave me an insight into the problem of violence not through dry statistical figures, but rather an opportunity to meet and look in the eyes of real women affected by violence, talk and decide in my heart and mind on how to work further in order to help them. It was a good start, but there is still a lot of work ahead"- Honorary Ambassador Maria Efrosinina shared her impressions. Masha Efrosinina spoke with 30 women who faced gender-based violence. They also took part in the workshop on the basics of make-up art, while Ukrainian photographer Lera Polska, the author of the "Fearless" project, shared her tips of behaving confidently in front of a camera. This activity has become a motivational event for women, which helped them to look at their lives from different perspective to break the cycle of violence. "I knocked at many doors. I asked friends and acquaintances for help. But they would only listen to me and nothing else. However, here (in the shelter - UNFPA) I felt the support from people who are really caring", Oksana, the crisis center client, shared her impressions. At a meeting with Deputy Mayor Valentina Bierlin and heads of various government agencies involved in the domestic violence response system, Maria Efrosinina appreciated the innovative and ambitious approaches to combating violence, which means that public sector structures pay proper attention to this problem. Kryvyi Rih was not randomly chosen for Maria Efrosinina's first trip in a new status. The Dnipropetrovsk region is one of the regions where the UN Population Fund deployed mobile social and psychological assistance teams and actively opens shelters with the support from local authorities, the Ministry of Social Policy and donors. Therefore, 2 mobile teams operate in the Kryvyi Rih, and in June 2018, with the financial support of the German Society for International Cooperation (GIZ), the Crisis Center "With Hope to the Future" was opened in a new building, accommodating up to 30 clients at a time. The event is a component of the United Nations Population Fund's large-scale program "“Integrated response to end gender-based violence against vulnerable women and adolescent girls in Ukraine", implemented in close cooperation with the Ministry of Social Policy and with financial support from the Government of the United Kingdom.